During my recent birthday, I got this message from OKCupid. They refused to send me a fling, just because I am already in a relationship! That's eh... "relationist!". So, keep your carb-loaded cake and send me some hot meat instead! 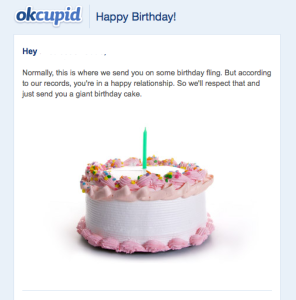 FTR: We love OkCupid. Since creating accounts on there, we have discovered more Fetlifers (Kinksters) than on Fetlife itself. In this case, it is a little ironic that a dating site so proud of being open to various relationship forms makes assumptions on the behavior of its users. Besides, if they really loved me they would know to bring chocolate cake instead.